Which promotions discount is more effective: Free Shipping, X Dollars off or Y% discounts. This article is from the weekly series of posts about eCommerce Email Marketing Best Practices. There is nothing more iconic than a sale sign in a retail store. Sales are the number one reason people will buy items that they do not necessarily need just because they think they are getting a good deal. Offers with Discount Coupons in eCommerce Email Marketing are very popular among online and traditional retail brands. Every day I open my email box it is flooded with emails offering anywhere from 10% to 90%, $10, $50 off, and so on. How do you stand out with your incentive from the crowd when everyone around is offering some sort of discount? There is no one winning formula of the promotional discounts in email marketing. The guiding principle is to tailor your offer to the products you sell and your customer audience. For example, there is no point offering a bundle discount on winter boots but a bundle deal is great for a product that is used frequently such as shampoo. 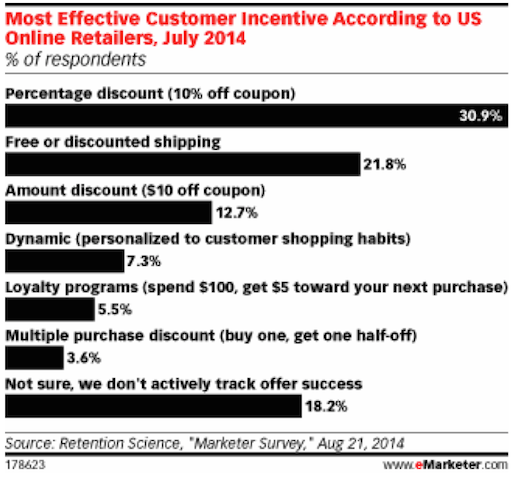 About 93% of Shoppers Use a Coupon or Discount Code Throughout the Year. Online coupon codes are very effective way to increase sales, they are easy to implement and shoppers are actively seeking them. 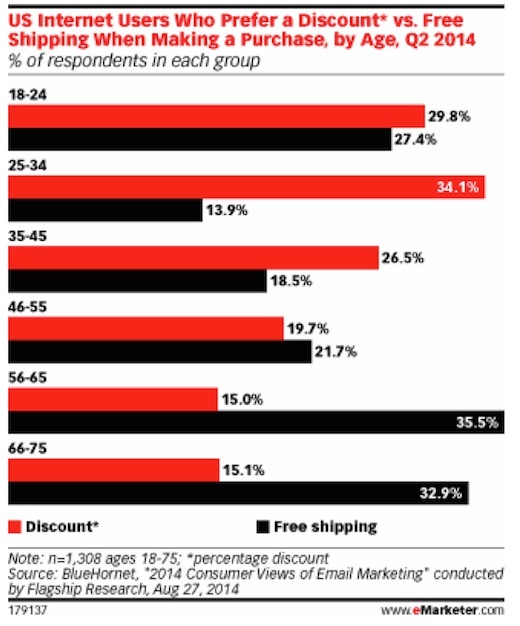 We can see from the research that for age segment 25 -34 discount offers outperform free shipping, but free shipping is more important for 56 – 65 age demographic. Because of that we have to consider who is our prime customer segment and personalize our offers by demographic to maximize promotion success rate. 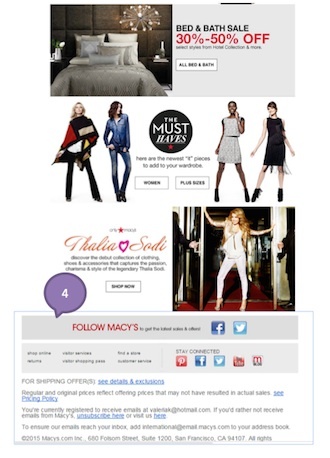 This week we are reviewing e-commerce emails with coupons and promotional discounts from the following retail brands: Macy’s, Layla Grayce, SHOEme Saks Fifth Avenue, The Bay. This email is one of the best coupon promotional emails. It has a very catchy and personalized subject line. It has VIP Coupon promotion with link directly to the products on sale and a clear indication that the offer just for me, which makes the shopper feel more connected to the brand. The remaining sections of the email link to other promotion so there is no confusion on which promotion is a priority. This is a great looking email. It has pretty colors and pictures. 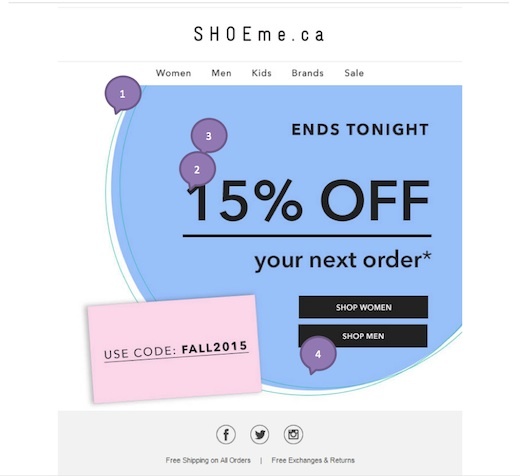 The discount code is clearly indicated at the top of the email. 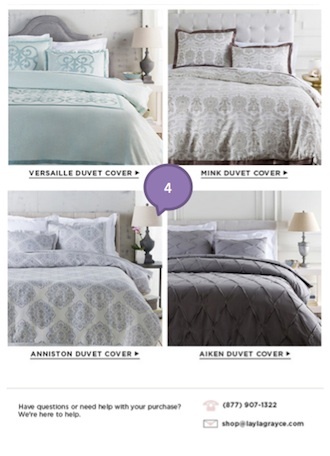 The colors chosen are great since they are gender neutral and can appeal to a wide range of shoppers. 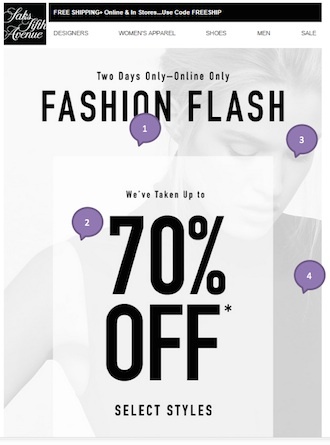 This a very simple design of a discount email with no visual assets. It is clear and straight to the point. Such promotions are more for a direct purchase based on a specific need versus a more impulse purchases based on emotions. 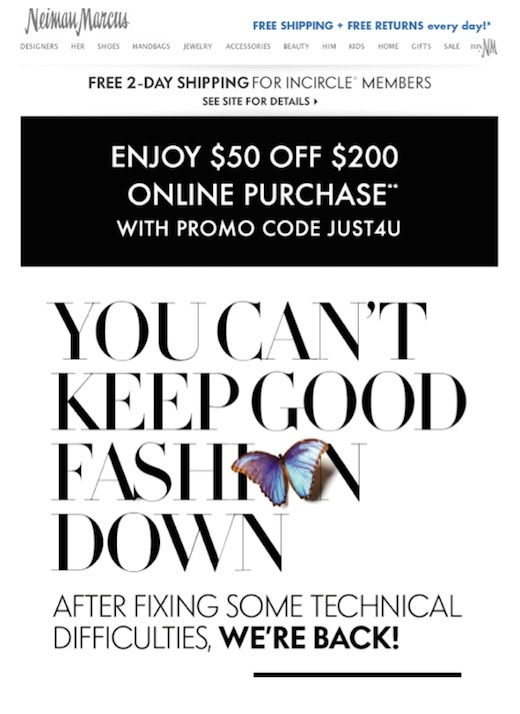 The biggest issue with this email besides style is the fact that there is no promotion code and a specific product that might be on sale. Such promotions usually have low conversion rates since the shopper does not really know what he will get once he/she clicks the link. The dark background makes the font hard to read or clearly see the image. There is no promotional discount code and I am really confused why sleepwear and lingerie are part of the dress sale. 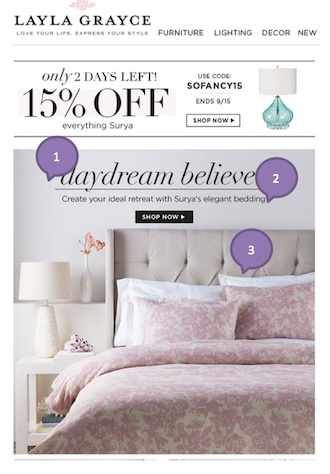 This an example of a promotion that is not very clear in terms of setting expectations for a shopper based on the subject line which will have low click through rate. I did not even know that the site had issues but received this email. It is a bold move to notify all their customers about their store having issues. People that were actually affected by this outage might not be impressed by this offer. Integrate with instore– make sure that the coupon code used online and in store available in digital format. The last thing you want is to make people print coupons. Integrate with social media – promote coupons on all social channels to get the word out to as much audience as possible. Include sharing and likes links for all promotions. Include great visuals– Include pictures of products that are sharp with bright colors and fonts that will intrigue consumers. Target consumers based on location – With geo-targeting able to take advantage of consumer location to deliver coupons when they’re nearby. Do not overuse – do not include more than 1-2 offers per email. There is nothing worse than being confused by what the offer that is applicable to the purchase really is. Do not repeat – do not use the same type of coupon every week as they will lose their appeal very quickly. Personalize-Include personal information such as name, location or other information will help appeal to the emotions of shoppers. Try not to send offers that might be offensive to certain demographic groups unless you have a well-segmented list. Make coupons discount specific – make sure that discounts are relevant to the products you are selling. Experiment with bundles, multiple discounts or free offers if those are applicable for your store type. 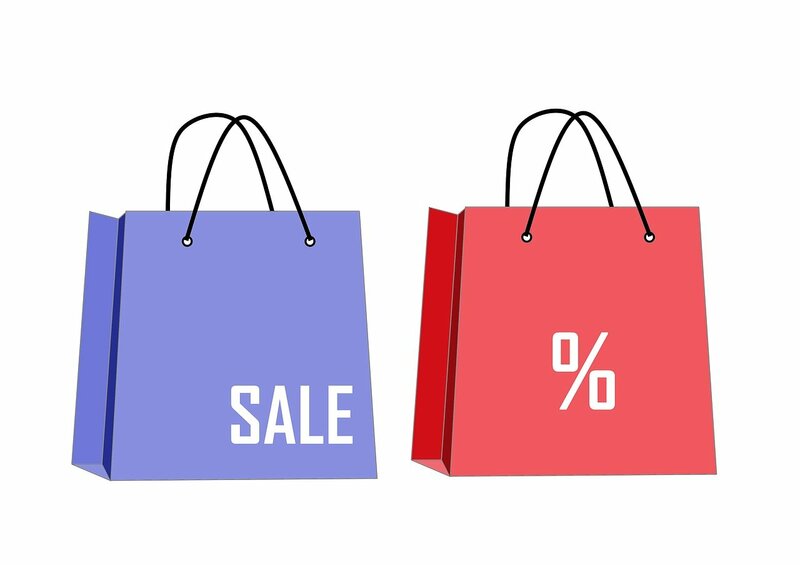 Manage your stock – Make sure you have a good stock of the item being discounted – otherwise the sale will be insufficient, as shoppers will get bad customer experience based on unavailability. It does not matter how big the discount is if you cannot buy it. Let the coupon wars begin!